Color a snowflake by growing it over a colored craft stick or by adding food coloring. Real snowflakes are beautiful, but melt quickly. Grow borax crystal snowflakes and enjoy them as sparkling ornaments or decorations year-round. The snowflakes are naturally clear or white, but you can tint them blue or any color you like. To make a snowflake shape, cut a pipe cleaner into three equal sections. It’s okay if they don’t start out exactly the same length. Hold the sections together and twist at the center to join them. Pull the six “arms” out evenly. Select one arm to fold over a pencil or butter knife to hold the snowflake. Trim the ends to make them even and so the snowflake will fit inside the jar without touching the bottom or sides of the container. Remove the snowflake from the jar and set it aside. Fill the jar with very hot or boiling water. Stir borax into the jar until it stops dissolving. The amount that dissolves in boiling water is 3 tablespoons of borax per cup of water. It’s okay if a small amount of borax remains undissolved at the bottom of the container. However, if there is a large amount of undissolved material, it can compete with the snowflake for crystal growth. The solution is to pour the liquid (once it is cool enough to handle) into another container. You can either use the new container to grow the snowflake or else rinse out the borax from the old container and return the liquid to it. If desired, you may add food coloring to the liquid to color it. Hang the snowflake in the liquid, making sure it does not touch the sides or bottom of the jar. Set the jar where it won’t be disturbed and let the crystals grow overnight. Remove the snowflake and either hang it to dry or else set it on a paper towel. 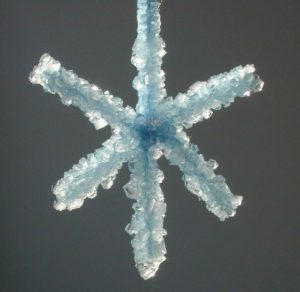 The borax crystal snowflakes can be used year after year, but the crystals have a tendency to react with water in air to develop a white crust. You can minimize this by wrapping a snowflake in a paper towel or tissue paper between uses and storing it in a plastic bag with a silica gel packet. Silica gel packets come with many products, so you can use leftover ones from around the home or else purchase silica gel from a craft store. Pipe cleaners come in various colors, including metallics. It’s actually easier to get a pretty colored snowflake by using colored sticks rather than dye. Metallic or iridescent sticks add extra sparkle to the crystals. Snowflakes aren’t the only shapes you can grow. You can make crystal hearts or crystal stars, too. If you coat the pipe cleaner with glow paint, you can make the crystal snowflake glow in the dark.